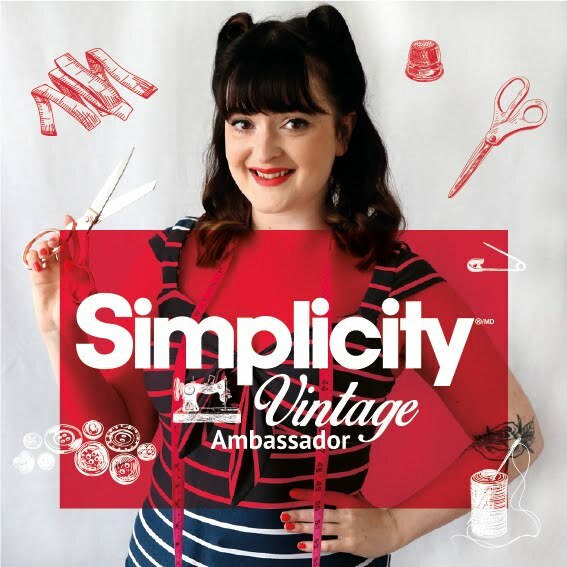 Weekend Wishlist #5 - Sewing Space Essentials! I'm very lucky as my boyfriend made me my baby pink peg board. It's so useful, and this large board that also comes with pegs is a great buy-as-seen choice! I love these sewing boxes! How will you paint yours? 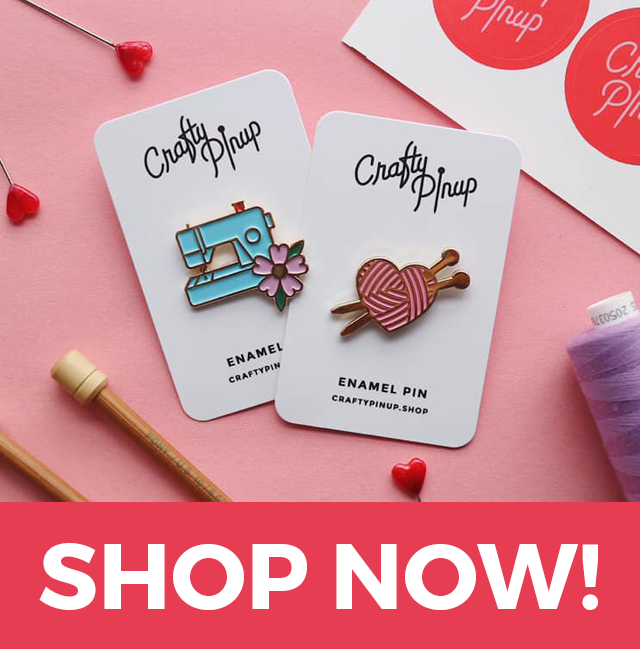 You'll need some extra pretty sewing supplies to display, right? I love my Hemline Rose Gold scissors! Making cutting out so much easier, and it comes in pink? This is on my wish list! Buying this mannequin has made my dress making so much easier for fitting. And it's always nice to display your latest make! This is my sewing machine and it was worth every penny! 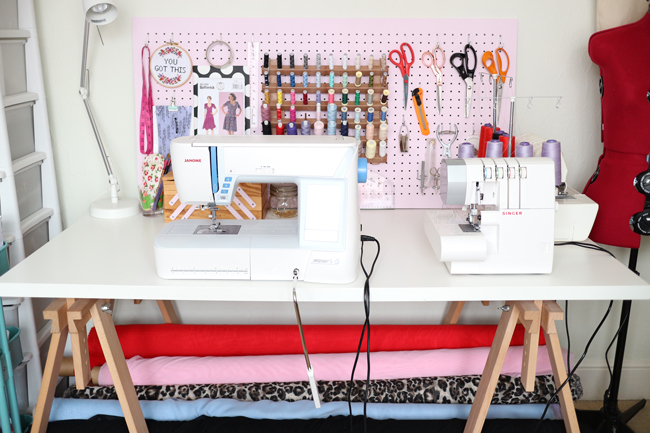 What are your sewing space essentials? 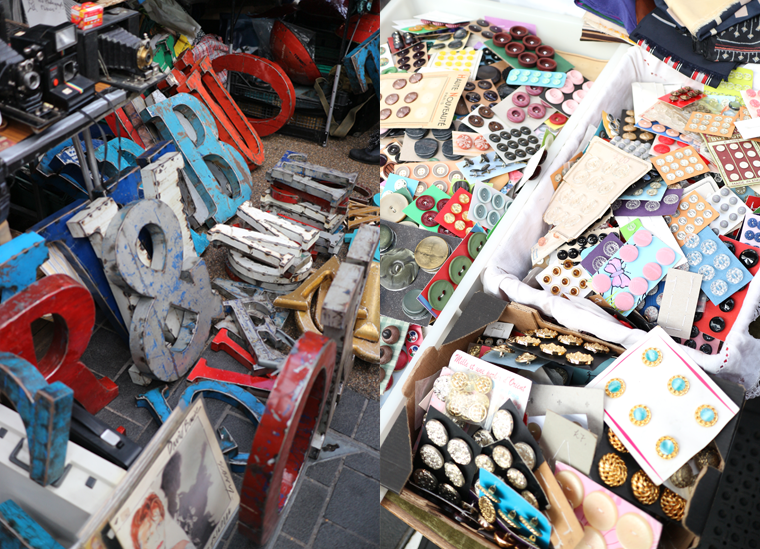 Are any of these added to your shopping basket? Sewing For Pleasure Review & Mini Haul! Hi pinups! 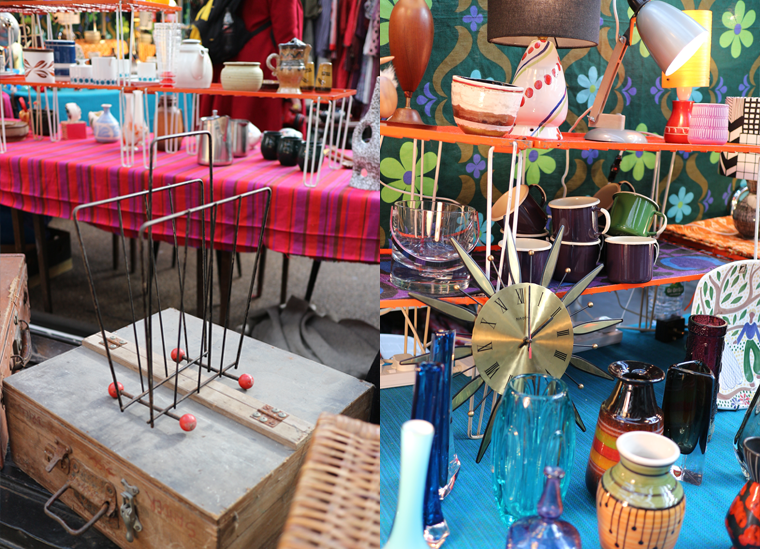 Last Friday I went to my first ever sewing show. If you follow me on social media, you'll know I attempted to go to the Knitting and Stitching Show in London a couple of weeks back. I say 'attempted', as I had my press pass ready to go, got dressed up in my latest make and got in the car to travel down (I live about 4 hours away in the car & Dad had offered to drive me and my mum), but out of no where we had horrendous weather and it became too dangerous to drive. It was bizarre, I'm talking snow, torrential rain and crazy winds. So sadly we had to turn around and come home after less than an hour in the car. So I thought I'd try my luck at the Sewing For Pleasure Show at the NEC in Birmingham instead (also a lot easier to get to on the train for me). 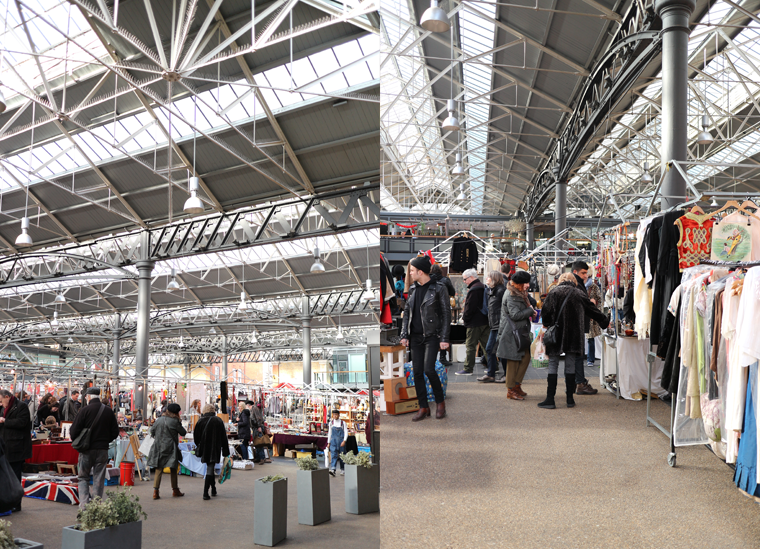 Did you visit the Sewing For Pleasure Show? What did you think? Hi pinups! 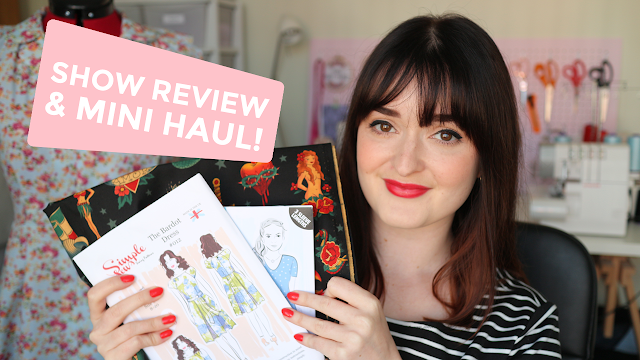 I'm so excited to finally share this make with you! I knew as soon as I saw this gorgeous classic tweed fabric I needed to make it into a coat. Combined with the 'very easy' V9123 pattern and a polka dot lining, it was a match made in heaven to create my dream coat. Fit: Just as I wanted. Watch out for: Tidy finishing touches will make this simple pattern extra chic! Look out for the center front corners and even button holes. See this coat in my February Sew & Tell YouTube video HERE! How to Make a DIY Rockabilly Pinup Bandana - Full Sewing Tutorial! Hi pinups! 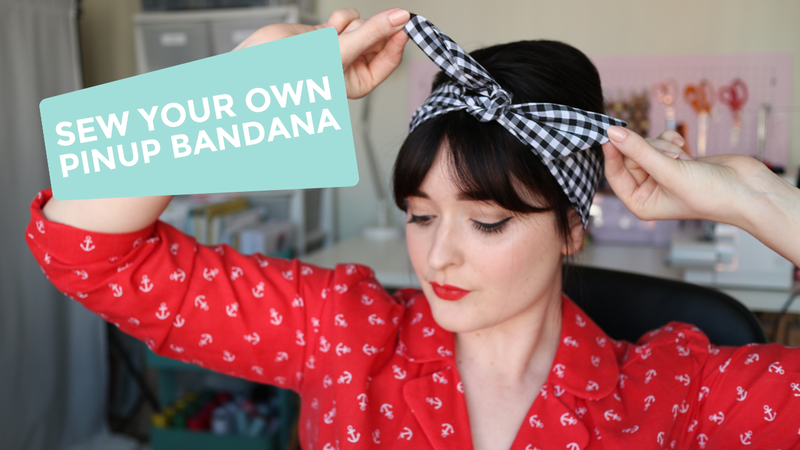 Instead of a Weekend Wishlist post this weekend, I'm sharing my first ever YouTube sewing tutorial with you (as it's consumed my week trying to make it). 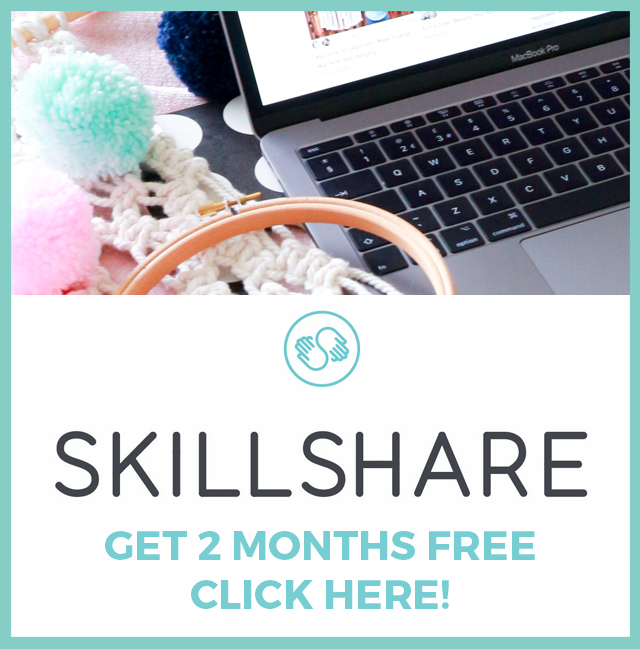 Not only is it super quick & simple to make and great for all sewing abilities, it's the perfect fabric stash buster for those lovely scraps you can't bring yourself to throw away! If you try it out, please let me know and tag me @craftypinup in your snaps so I can see & share! Camera malarkey and video editing do not come naturally to me at all! I know there's improvements to be made, and I'm still learning, and BOY is there a lot to learn! This video took me 15mins to film and then 8 hours to edit. Yep. 8 hours. I had to learn about software, download software, learn to use it then edit my video. Hopefully next time it'll be a lot quick. I really love filming and I hope that comes across in my videos. Thank you for watching, liking and subscribing, it means a lot to me. 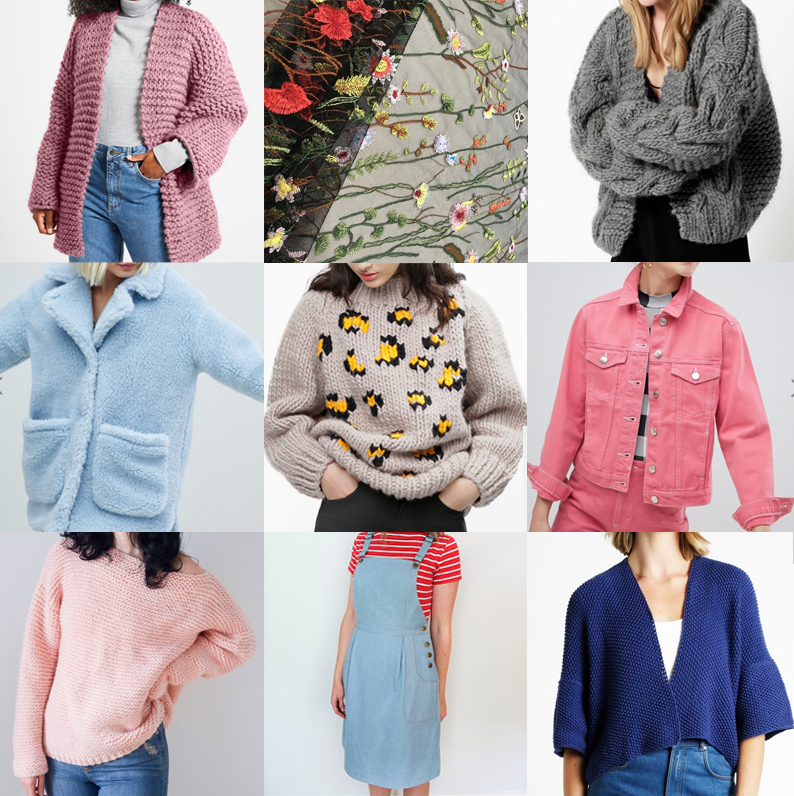 Want some shopping inspiration? 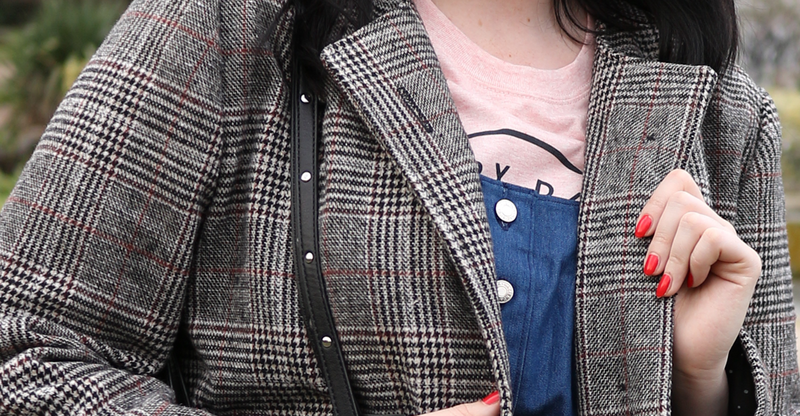 Check out last weekend's wishlist HERE, full of ALL THE GINGHAM. Thanks for reading and watching, pinups! I'm so excited to share this dress with you! I feel so lucky with my sewing mojo having made my two of my new favourite dresses in a row (the first being THIS Simplicity number). 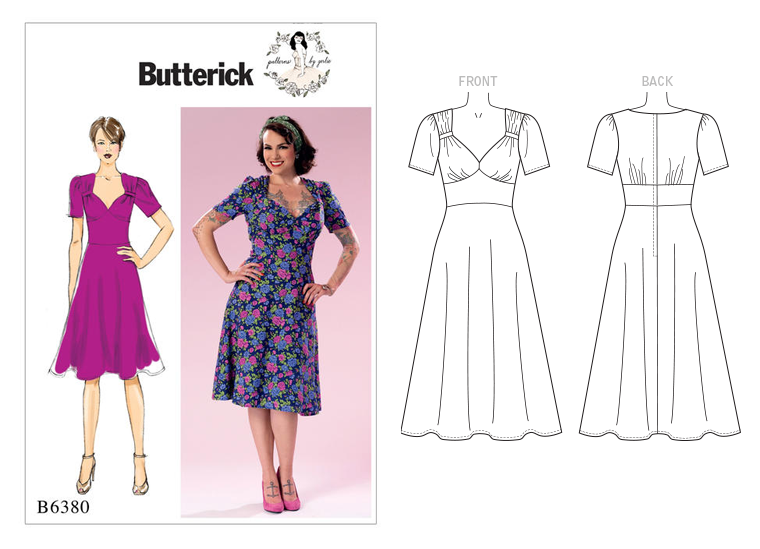 I've be lusting after this Butterick B6380 pattern since it came out and have had it in my pattern stash since last year, waiting for the right fabric to come along! 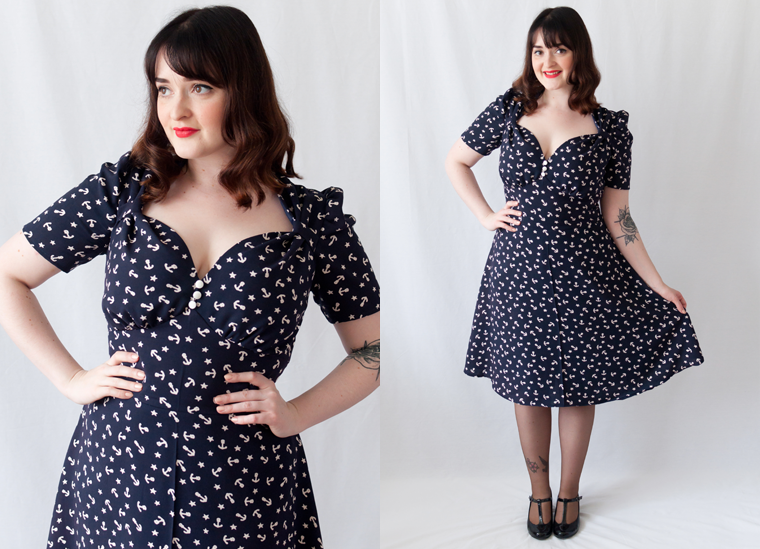 It's a classic 1940s vintage style tea dress, designed by my sewing muse Gertie. 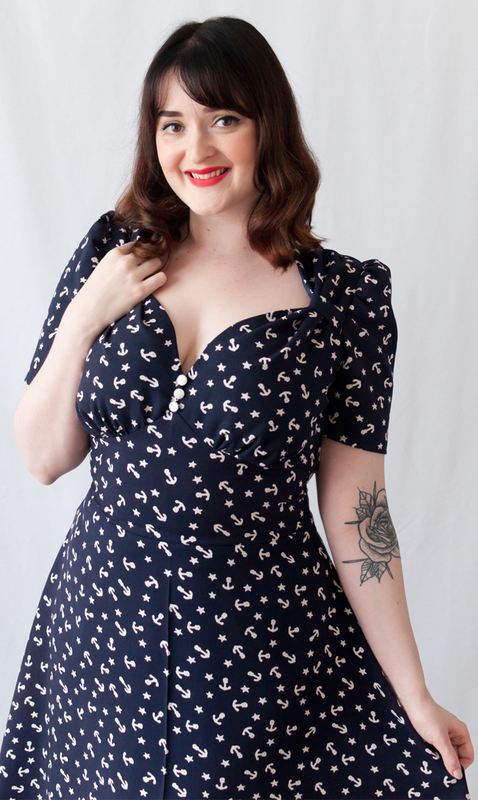 I've not made a dress quite like this yet, but it's a style I love and hoped it would be flattering on my curvy figure. Before I sew a new make, I like to have a look around online to see people's versions of the pattern sewn up. But it was really hard to find any versions of this pattern and I have no idea why! 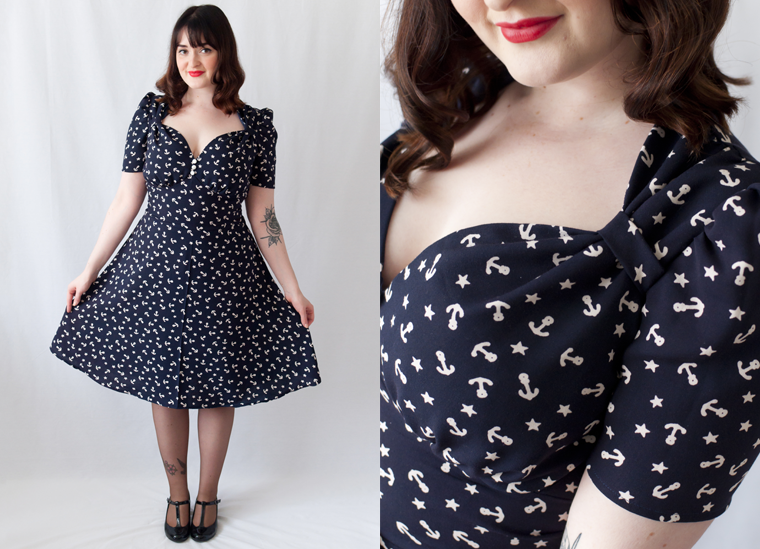 So hopefully my review might sway anyone who was thinking about this pattern and inspire someone else to sew it too! Why didn't I make you sooner? Personally, I hadn't jumped on this pattern straight away as I was daunted by the style and it is fully lined. I thought it may have been a little ambitious and a bit of a jump from a cotton shirt dress (my usual!). However, I'm pleasantly surprised with the difficulty of this pattern and it was far more straightforward that I had expected. I love the details of the pattern, especially the neckline. I made the dress in about a day, leaving the hemming to the following day. The instructions were clear and easy to follow and whilst the pattern has some details which might look a little fiddly, it actually came together pretty quickly. The fact the dress is fully lined, makes it feel extra special. The lining certainly does suit the dress and adds volume and stability to the shape. Instead of a lapped zipper, I chose my trusty old concealed zip. I did have a little bit of a wobble trying to figure sewing the concealed zip with a full lining, but only at the bottom of the zip. It looks lovely and tidy from the outside, but there is a bump on the lining on the inside. But I can live with that. I'm a UK 10/12 with a 34DD bust, I cut the size 14 on the packet. Once I had sewn the dress up to the point of adding the zip, I made some alterations to fit my shape. Personally, I like to cut a generous size and take it in later after trying on. Having a large bust, I find this the easiest way to get around it. I could have done a full bust adjustment to the pattern piece, but this style of the bust and neckline are pretty flexible. Once I had taken a few inches off the back, it fits like a glove. Overall, you can probably tell, I'm over the moon with this dress. 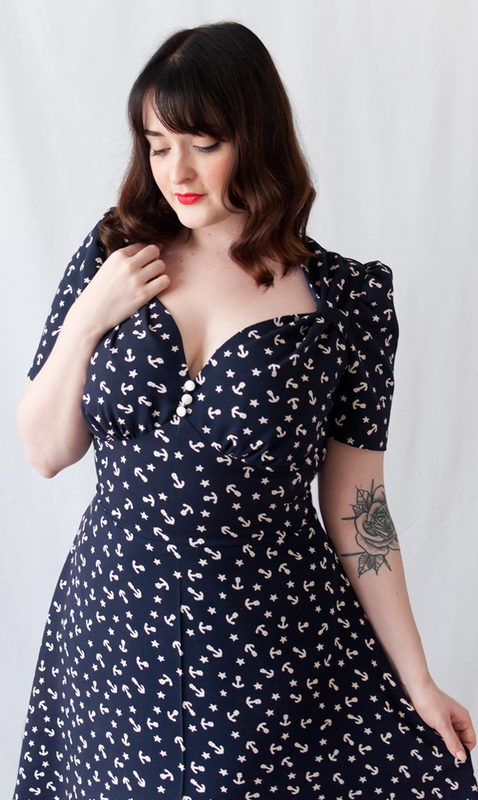 I think the design is super flattering on me and will be great for ladies with a larger bust and hourglass figures. I wore it with my favourite Coffee Seamed Stockings from my shop for a true 1940s look and I think they were meant to be. 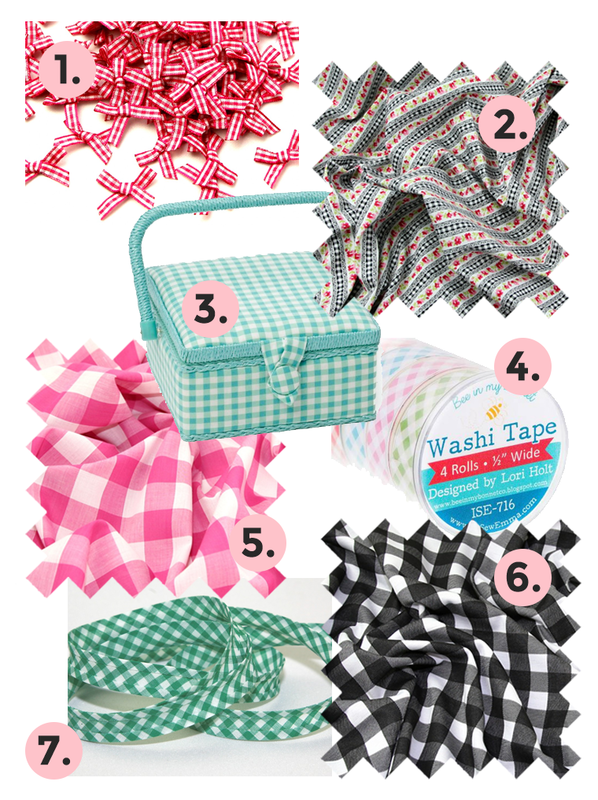 Weekend Wishlist #4 - Gingham Sewing Supplies! I could happily make everything in gingham forever, but I think you either love it or hate it! It's a classic print, always looks chic and stylish and it just so happens to be 'on trend' for this Spring/Summer. So this week's Weekend Wishlist is all about my love of gingham and some sewing supplies you'll be lusting after too! Bows make such a sweet finishing touch, especially on knickers! I LOVE this fabric, I'm planning on getting some to sew a vintage dress with. It also comes in loads of colours, I'm still undecided on which to choose! Cute sewing box alert. You can never have too much sewing storage, right? I love pretty stationary and washi tape brightens up my daily planner. 5. 1" Gingham Dress Fabric - Multiple Colours Available! A classic gingham fabric perfect for dress making, and this comes in so many colours, I've already been through black, pink and blue! This fabric looks right up my street and combines my two fave things! I think I'll need to snap some up for an Agnes top soon. I love pretty hidden insides, and this gingham binding will do the trick nicely. It'd also make a great trim for bunting! PART TWO | London Adventures ft. My Me-made Outfit! 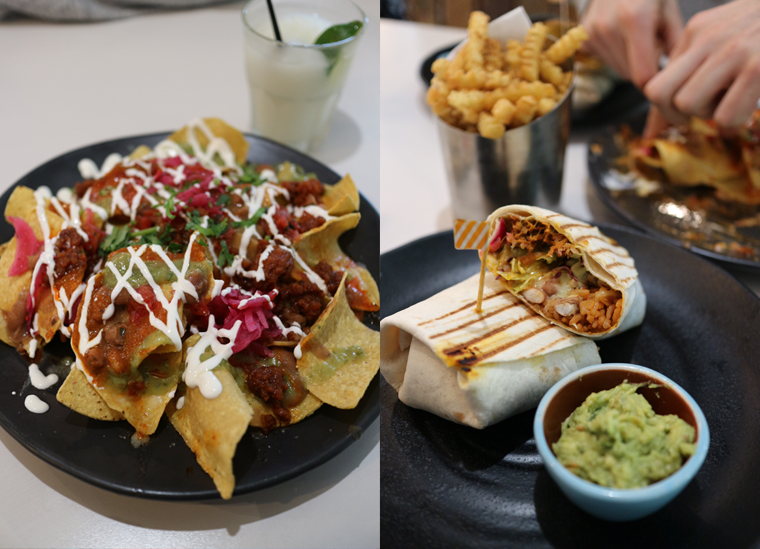 We ended up in DF/Mexico an amazing and vibrant Mexican restaurant and I'd happily spend the rest of my life eating nothing but this burrito over and over! 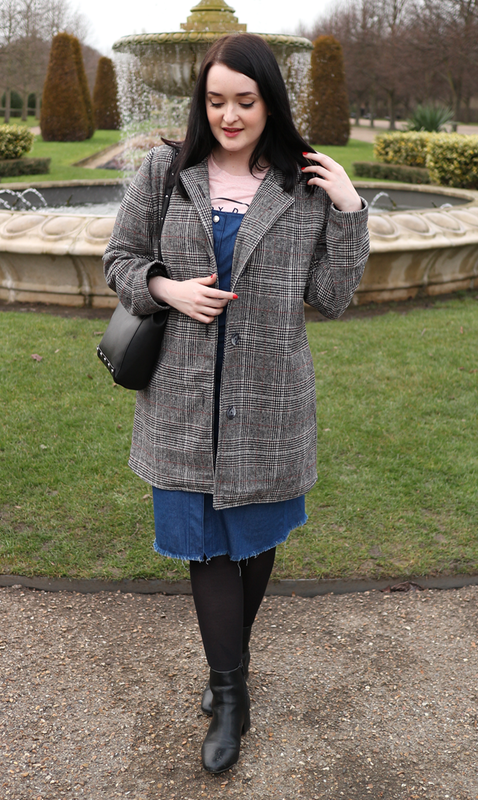 We ended the day in a very cold Regent's Park, where I managed to take some outfit snaps. 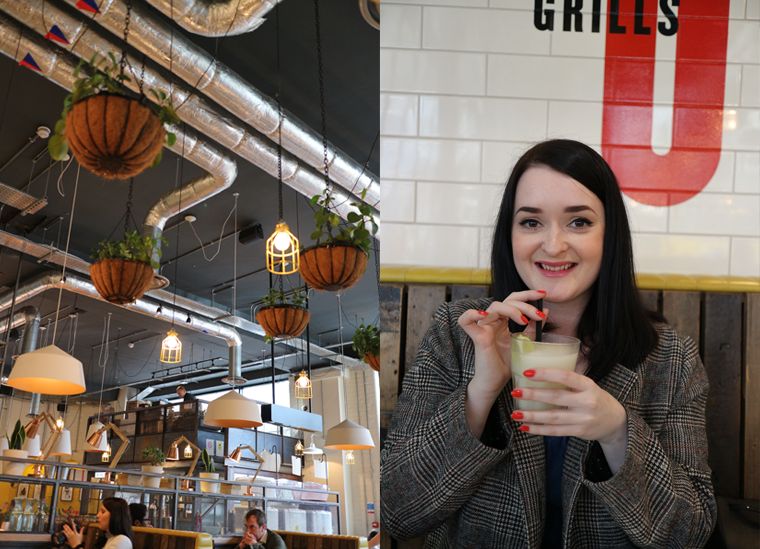 Although I certainly haven't mastered the nonchalant posing for photos in public thing that fashion bloggers seem so good at. 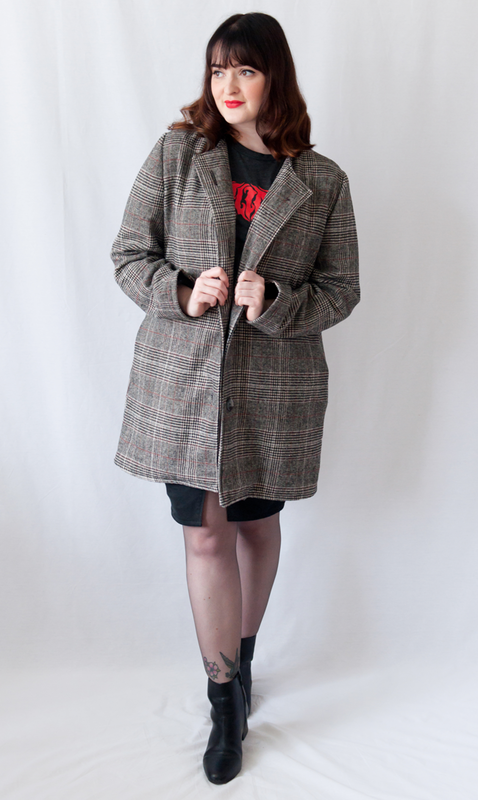 I'm all chins and flat hair here, but at least you can see my new Vogue 9123 coat! 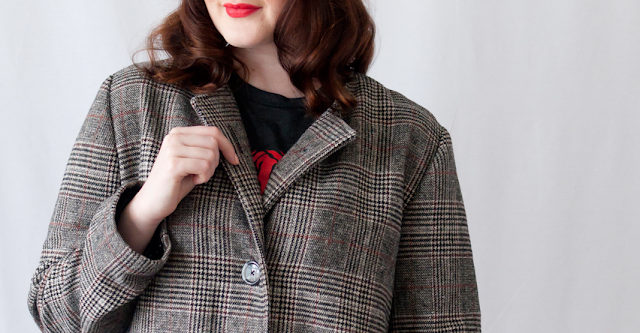 This tweed coat is my February Minerva Craft Blogger Network make and will be up on the blog soon with more snaps and a full review. 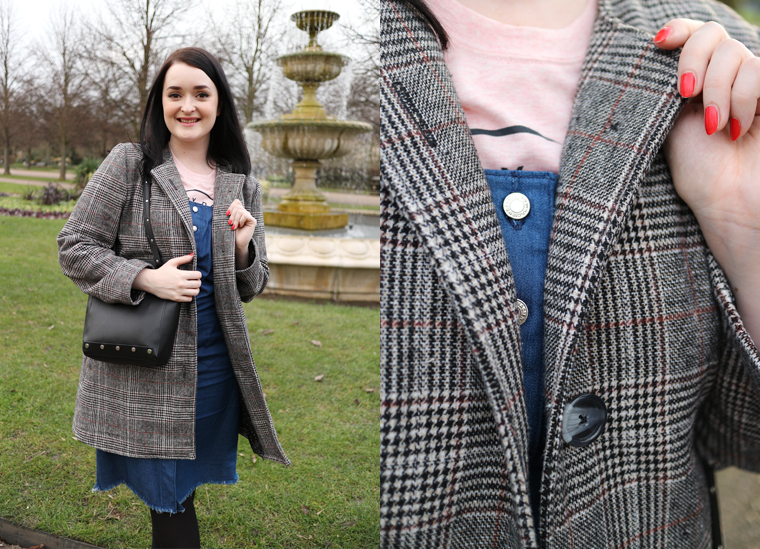 I styled my coat with my favourite Cleo dungaree dress, but this is my sassy button up pattern hack, which you can copy HERE. P.S. I'm on YouTube! 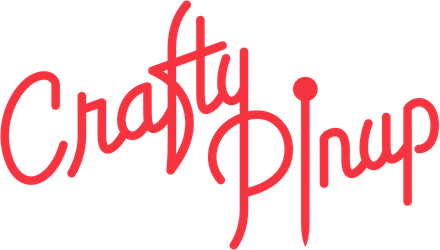 I launched my channel The Crafty Pinup last month. Check out my Seamstress Tag video where I answer 12 sewing themed questions HERE! Hi everyone! 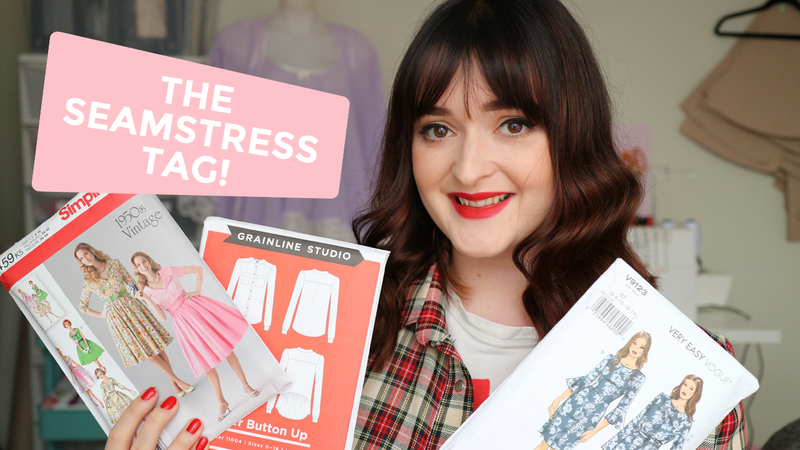 I'm back with my second YouTube video and this time I'm taking part in The Seamstress Tag. 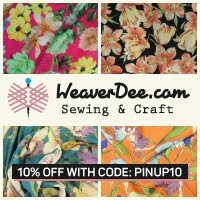 I'm answering 12 sewing themed questions and doing some sewing chit chat, so grab your favourite cuppa and enjoy! Don't forget to subscribe so you're the first to know about my future videos. If there's anything in particular you'd like to see in my videos, please comment below, I'm open to suggestions. 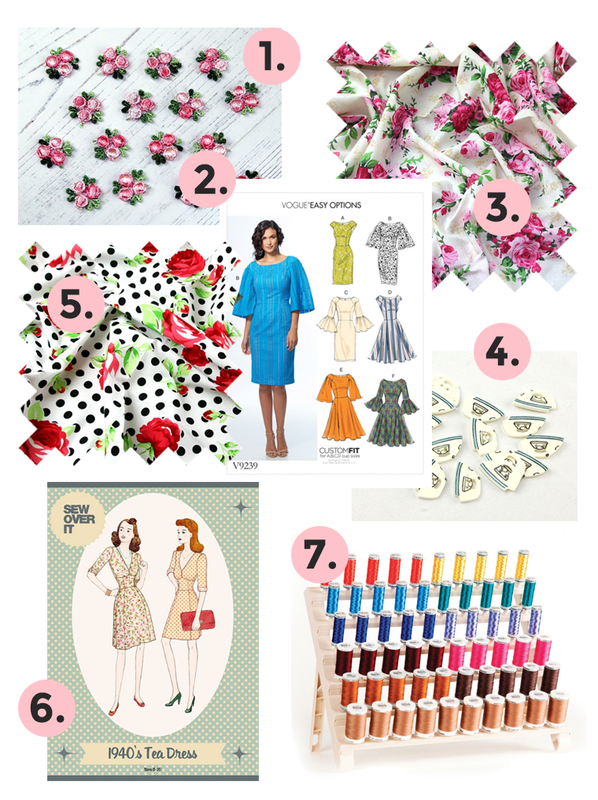 Time for another Weekend Wishlist and this week I'm lusting after Spring sewing and of course, florals. It's also a great time of year to do a bit or reorganising in your sewing space, and I love my spool holder. 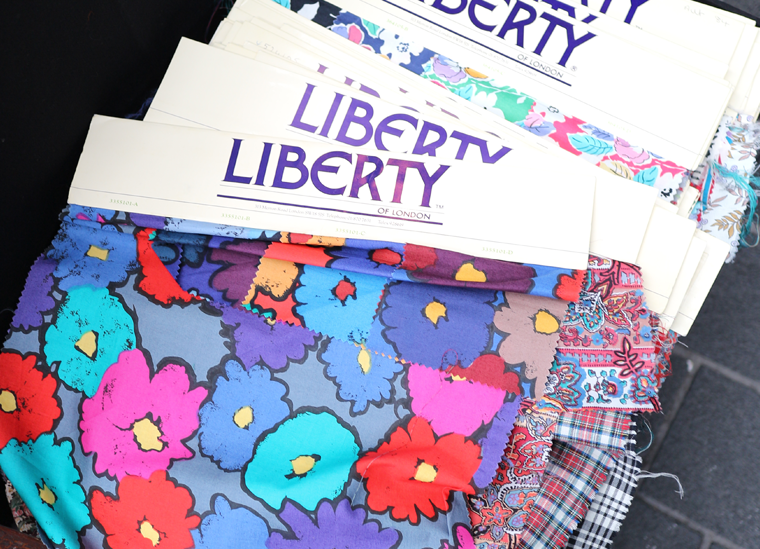 What's on your Spring sewing wishlist? As soon as I saw these teeny tiny rosebud motifs I fell in love. There's so many colours to choose from, I would love some on my denim jacket or on a shirt dress collar. One of Vogue's new patterns, I'm weirdly attracted to this non vintage/retro pattern. It must be those sleeves. Any one else trying this one? Why is it still so cold? I want to float about in this beautiful fabric! This fabric reminds me of one of Gertie's new fabric designs. Sadly we can't get them here in the UK but this one is a pretty good likeness to one of them. I see this coming home with me very soon! This pattern is in my stash and is waiting for the perfect fabric. The Sew Over It patterns are packaged so beautifully, you'll want to have them out on display. 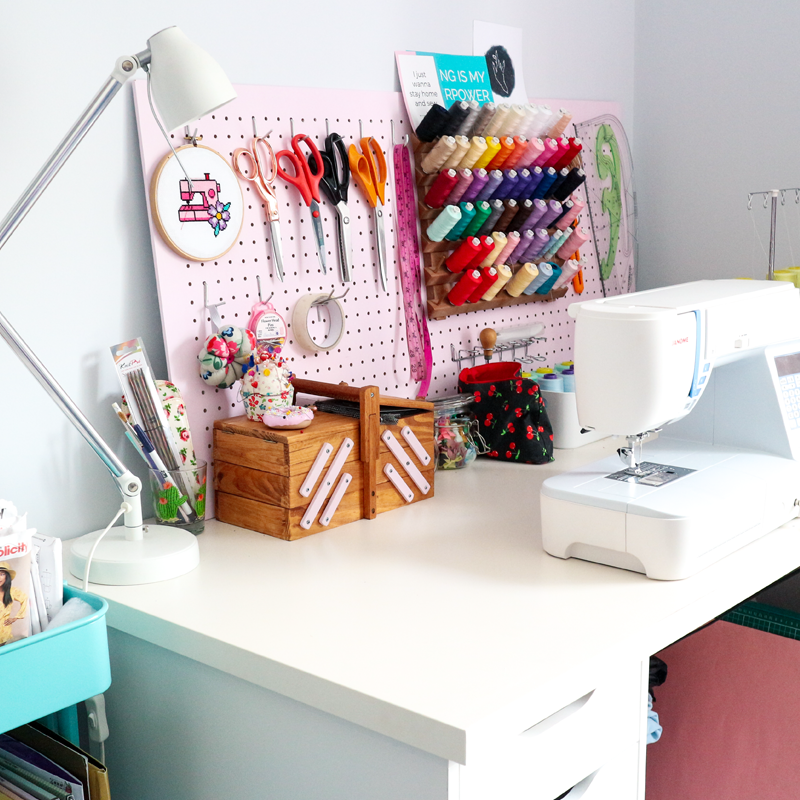 A sewing space must have!